After about a year and a half of construction, reservations are being taken at the new MGM National Harbor casino and resort. The hotel will open just before the holidays. Read about the new hotel-casino complex, and find out what rooms will cost. WASHINGTON — MGM says it is now taking reservations for rooms at its $1.4 billion MGM National Harbor casino and resort, with standard room rates starting at $399 a night. MGM says suite rates begin at $599. The resort will open to the public Dec. 8, about a year and a half after construction began. 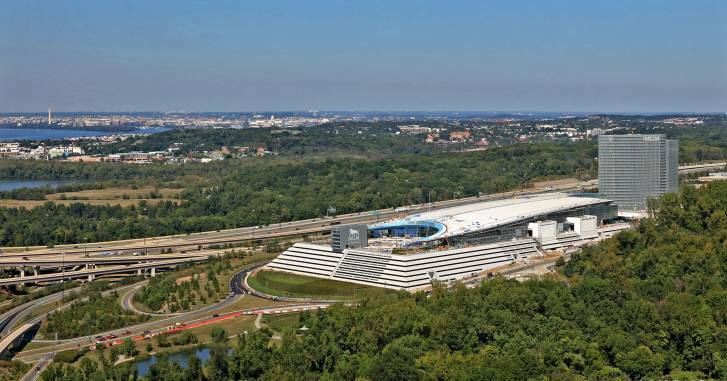 “Under one roof, guests will enjoy a sophisticated hotel experience, high-energy casino, celebrity-chef restaurants, world-class entertainment, night life, destination spa, upscale retail and curated art, complemented by incredible panoramas of D.C., Maryland and Virginia,” said Bill Boasberg, the resort’s general manager. Those celebrity chefs include Jose Andres, Marcus Samuelsson and Bryan and Michael Voltaggio. There also is a pastry shop, called Bellagio Patisserie, that has a 26-foot tall chocolate fountain circulating two tons of melted chocolate. MGM says it’s one of the world’s largest chocolate fountains. The million square-foot resort’s 23-story hotel has about 300 rooms and suites. The resort includes 125,000 square feet of casino space, with poker and other table games and more than 3,000 slot machines. Other amenities include a 27,000-square-foot spa and salon, 18,000 square feet of retailers and 50,000 square feet of meeting space. The casino also employs a lot of local residents, with more than 4,000 people on the payroll. MGM officially broke ground on its National Harbor resort in March 2015.